Please visit the FS2Crew Support Forum at Avsim.com for the full Change Log. THIS VERSION OF RAAS SUPPORTS MICROSOFT FSX, STEAM FSX, PREPAR 3D VERSION 1 TO 3. IF YOU OWN PREPAR 3D VERSION 4+, YOU NEED THIS VERSION. RAAS Professional supports FS9, FSX, Prepar 3D Version 1 to 3 and FSX: Steam. 2. Built directly into Flight Simulator (FS9, FSX and P3D V1, V2 and V3) with no need to launch an external application. This version does NOT support P3D V4 (64-bit). 3. Works with all aircraft. I love this program but I would love it even more if I could use it in a remote computer with FSUIPC and WideFS/Wide Client so I can hear it on other speakers or if I could select a different sound card. FS2Crew Comment: There's no need to run it on a separate computer. RAAS has an option to select a different sound card. Please check the manual. Thanks! Paying EUR 24.95 for an update when I just paid EUR 29.95 a few month ago. Forget it. I like the program but not worth the money they are asking. Very neat addition to FSX. I am a serious simmer and this adds another layer of realism whether online or not. Nice addition for any serious simmer! Easy to setup, even easier to use. Whether I am using online ATC, FS ATC or freelancing, it works exactly like it says and it is very neat. Just bought it yesterday and I am going on my 7th flight. Great product! 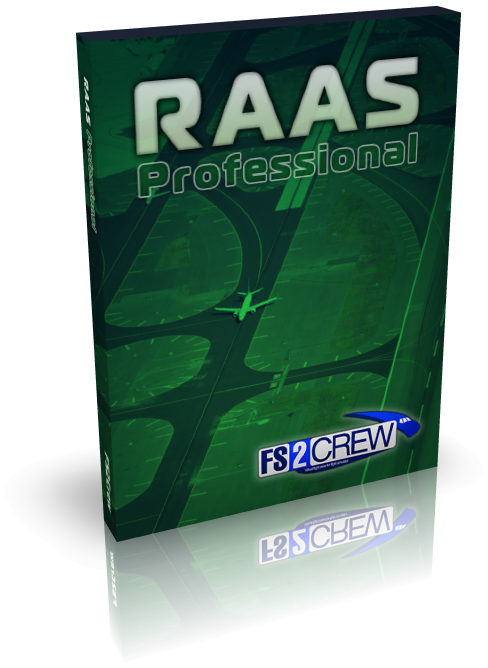 Click the button below to add the FS2Crew: RAAS Professional to your wish list.